52 million year old fossil sheds light on swift and hummingbird flight evolution « Nothing in Biology Makes Sense! During swift and hummingbird evolution how did these wing morphologies and flight style evolve? Fossils give us a way to directly answer this question. In Europe a number of fossils of this group have been found and described, though they largely fall outside of the modern lineage of this order. Ksepka et al. describe the oldest known fossil from within the modern lineage, a 52 million year old North American species of Apodiform that they conclude to be in the same lineage as our modern treeswifts, swifts, and hummingbirds based on shared morphological features. Their new species, Eocypselus rowei had a small rounded bill, a squared tail, and was slightly smaller than our living Chimney Swift and was better able to perch than modern swifts or hummingbirds (check out its long legs and large feet in Figure 1 from Ksepka et al.!). Based on preserved feathers E. rowei had a crest probably similar to living treeswifts and numerous hummingbirds. Preserved melanosomes (an organelle that stores the melanin pigment) from these head feathers indicate that this bird’s crest was black and glossy and possibly iridescent. Amazing information to glean from a 52 million year old bit of rock! Figure 1 from Ksepka et al. 2013. The authors interpret the length of the wing feathers to indicate that E. rowei had a wing shape intermediate to that of living swifts and hummingbirds implying that modern species have evolved more specialized wing shapes through time. I certainly can’t argue with tangible evidence. 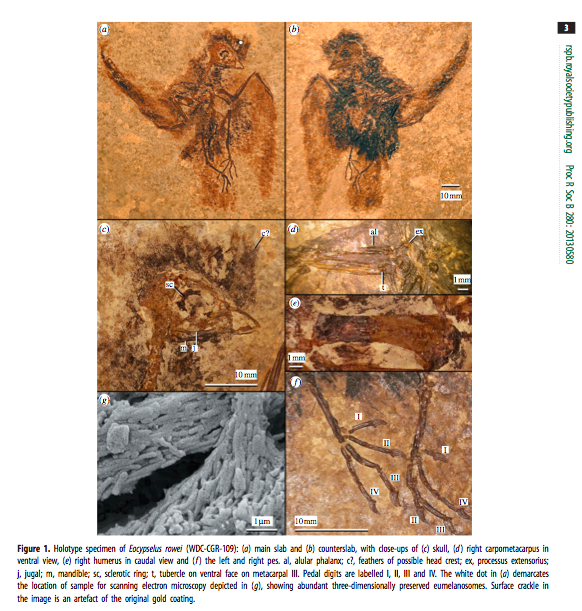 The remarkable preservation of E. rowei fossil gives remarkable evidence of this species’ wing morphology because not only are the skeletal elements preserved but the feathers including individual parts like the feather vane (rachis) and barbs are also intact. Despite the skeletons of swifts and hummingbirds being rather similar, the combination of these bones plus feathers gives sound evidence that this species had intermediate swift-hummingbird wing morphology. Eocypselus rowei is also remarkable because it is the smallest bird fossil to found at the Green River site in Wyoming. This site is home to a remarkable array of 52 million year old (early Eocene) fossils including numerous and quite beautiful fossils of birds, the oldest species of bats, large intact plant fossils and crocodilian. Measurements of morphological features of E. rowei and living close relatives were used to determine the phylogenetic placement of E. rowei. The authors then combined their morphological measurements with genetic data to support extant species phylogenetic relationships to place E. rowei in their phylogeny. The results from the combined approach (molecules + morphology) and morphological data alone led to nearly the same phylogenetic hypothesis indicating that E. rowei is basal to swifts and hummingbirds. In my opinion, these results merit a technical point that morphological characters can be used in lieu of molecular data in understanding species relationships, which is important when placing extinct species in the tree of life. Additionally, this oldest known fossil in the treeswift-swift-hummingbird clade is a very useful calibration point for dating species divergences in phylogenetic trees, because it provides a minimum age for a group. Systematists are always hungry for this type of fossil to calibrate their trees with; so between giving us insights into the morphological evolution, geographic distribution, historical biodiversity, ecology, and clade age, this chunk of rock is packed with a lot of useful data. We all won a piece of the geologic lottery with the discovery of the adorable E. rowei. Chantler, P. 1999. Family Apodidae (swifts). In Handbook of the birds of the world, vol. 5: barn-owls to hummingbirds (eds J del Hoyo, A Elliott, J Sargatal), pp. 388–475. Barcelona, Spain: Lynx Edicions. 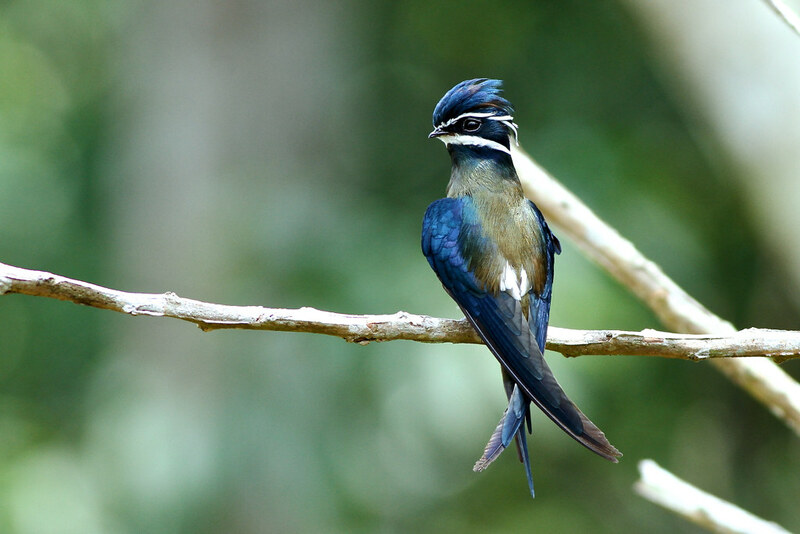 This entry was posted in paleontology, phylogenetics and tagged hummingbird, swift, treeswift.